UFC 216 turned out to be a very strange card. 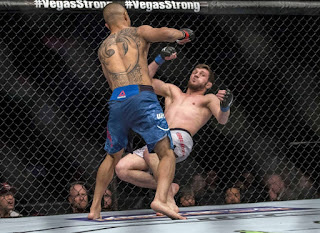 Between a last-second injury reshuffling several fights on the card, two fights being scored draws, and numerous upsets taking place, it was truly one of the oddest cards in quite some time. The weirdest moment of the night came before the card even started, when the UFC announced that heavyweight Derrick Lewis had pulled out with a back injury and his main card fight against Fabricio Werdum was canceled. That was bad to news to fans who had been looking forward to the fight, one of only a few fights on the card with name recognition and title relevance. While it was initially presumed that Werdum would be removed from the card altogether, the UFC instead broke apart an undercard heavyweight bout between Walt Harris and Mark Godbeer, paying Godbeer his show money and telling him to sit on the bench. 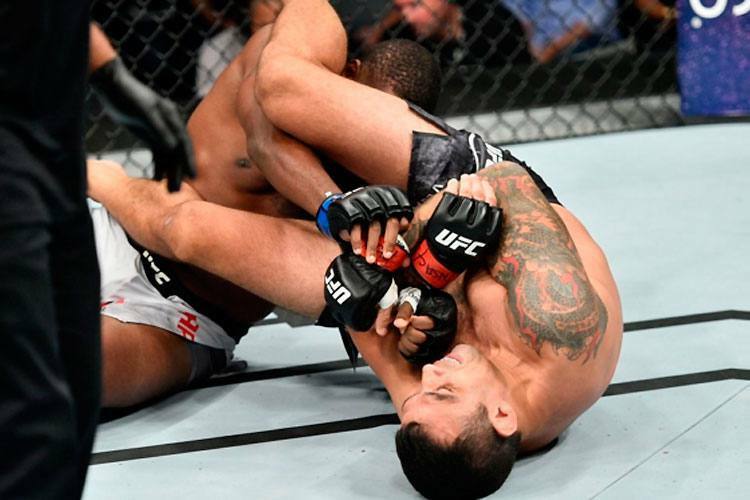 Harris, however, got a huge step up in competition on short notice, as he was booked to fight Werdum. Odds started popping up for the fight listing Werdum at only a slight favorite over Harris, which didn’t seem to make much sense. While Harris does possess KO power, Werdum is an elite heavyweight and Harris is not ranked. Not surprisingly, the actual fight proved to be a mismatch, as Werdum took Harris down and tapped him out with an armbar in 65 seconds. A very weird situation, to say the least. It was also weird that not one but two fights ended in a draw. That’s the first time since UFC 22 in 1999, before the Unified Rules of MMA were in place. No one could have guessed that both Bobby Green vs. Landon Vannata and Evan Dunham vs. Beneil Dariush would have ended in a draw, but the weirder thing was the judges actually got both of the decisions right! It’s rare enough to see the judges score one close fight correctly, let alone two. So that was also weird. And then there were the upsets. On the main card, Mara Romero Borella submitted Kalindra Faria in the first round with a rear-naked choke. On the prelims, Cody Stamann defeated highly-regarded prospect Tom Duquesnoy via split decision. And in the biggest upset of the night -- one of the biggest upsets of the year -- John Moraga brutally knocked out flyweight prospect Magomed Bibulatov. UFC 216 was a crazy card where a whole lot of things happened that not many saw coming. 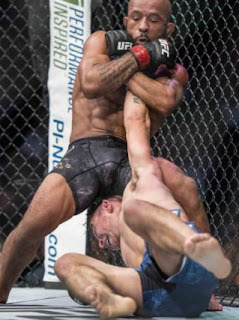 I haven’t even mentioned the incredible suplex-to-armbar transition submission that Demetrious Johnson pulled off over Ray Borg in the co-main event to break Anderson Silva’s record for most consecutive UFC title defenses. You don’t see a submission like that very often in MMA, to say the least. On the whole, UFC 216 wasn’t a great card. It lacked big names, depth, and several fights were canceled or changed at the last minute. Yet it still was an interesting and entertaining night of fights when you factor in all the lunacy that took place. A whole lot of weirdness went on, but that’s why we love MMA. We love the chaos and the craziness of it all, and UFC 216 certainly didn’t let down on that front. Now let’s see what UFC 217 has in store for us next month.